Image courtesy of Robotics @ Maryland. 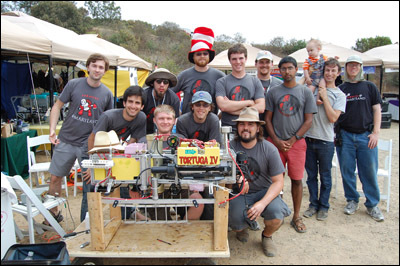 The Clark School came in 3rd among U.S. teams and 6th overall with Tortuga IV at the 2012 Association for Unmanned Vehicle Systems International RoboSub competition. Co-sponsored by the U.S. Office of Naval Research, the goal of this competition is to advance the development of Autonomous Underwater Vehicles (AUVs) by challenging a new generation of engineers to perform realistic missions in an underwater environment. The event also serves to foster ties between young engineers and the organizations developing AUV technologies.